This monitor is meant to identify key developments during the month on Civil Military Relations in Pakistan with selected high-profile international developments included occasionally. National Security Advisor meets former Premier? On December 30, Federal Minister of Defence, Engr. Khurram Dastgir Khan, MNA, made highly significant pronouncements on civil-military relations and the role of Minister of Defence. It is difficult to recall a more candid interview by a Pakistani Defence minister on the subject of civil-military relations. This is a sensitive and serious matter, seldom discussed in the open by a sitting Defence Minister in the past, leading the country to an almost definitive but discomforting conclusion that civil-military relations may be moving towards an era of ‘open warfare’. No country can allow such tensions between State institutions or between popular political parties and the security establishment, especially given the prevailing tense relations with a superpower and some neighbouring countries. While the briefing was in-camera, news media reported details through various quotes from the DG ISPR as well as a number of Senators who were part of the briefing. The meeting, we are told, lasted for over three hours, in which first the COAS “gave an overview which was followed by a detailed presentation by Major General Sair Shamshad Mirza, DG MO.” After the presentation, the COAS “personally answered the questions asked by the Members which touched upon all areas of national interest and security,” as per the Senate website. In recent history, Gen. Bajwa is the second COAS to have come to Parliament for a briefing following such a briefing by the erstwhile COAS Kayani and then-DG ISI Lt. Gen. Pasha who briefed joint session of the Parliament in May 2011 after the killing of Osama bin Ladin in the Abbottabad operation. In terms of personally answering the questions of the parliamentarians or any of its committee, Gen. Bajwa’s may be regarded as the first of its kind. That the COAS briefed a house of the Parliament is both a good development and also brings home the stark reality of the miles Pakistan’s democratic oversight of defence have to travel to follow the norm in other developed democracies. The fanfare with which the COAS was received was almost similar to a head of a State opening the Parliament in Pakistan or in other democracies. Such appearances are common and usual occurrence in democracies such as UK and next-door India where heads and representatives of respective defence forces regularly appear before their relevant Parliamentary committees to both brief them and answer their questions. The Parliament and Pakistan’s democratic order need to efficiently and speedily evolve in a manner that such briefings should be a normal and regular occurrence by the relevant Parliamentary Committees and not at the level of Joint Session or one house of Parliament. Khwaja Saad Rafique’s statement on December 24 generated a great deal of heat and controversy. His words seemed to imply that subordinate institutions under the Army Chief create occasional mischief although the stated policy of the Army Chief was pro-democracy and in harmony with the civilian government’s policies. The DG ISPR did not waste much time in declaring the Federal Minister’s statement ‘irresponsible’ at a news conference. First time after the disqualification of former Premier Mr. Nawaz Sharif, National Security Advisor to Prime Minister, Lt. Gen Nasser Khan Janjua, reportedly met with Mr. Sharif, at his Jati Umra residence in Raiwind, Lahore on December 28. Reportedly, the meeting continued for 5 hours, where Mr. Sharif stressed on the need to maintain friendly ties with neighbouring countries. Later some media reports contradicted that such a meeting ever took place. Both the former PM and NSA’s office neither confirmed nor denied the meeting. If the meeting took place, it was not clear what NSA might have discussed for five hours with the former PM who does not hold a public office any more. On a three-day visit to Karachi, from December 22-24, during an operational review of the Pakistan Navy, Prime Minister Abbasi boarded a submarine in open sea, which made him the first Prime Minister of Pakistan having done so. 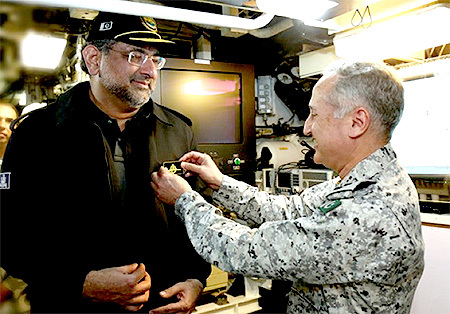 He was awarded the Dolphin insignia of the Pakistan Navy. He also witnessed replenishment exercise by the Navy, rocket depth charge firing by ship & aircraft and helicopter-borne board, search & seizure. The premier expressed satisfaction with the operational preparedness of the Pakistan Navy.